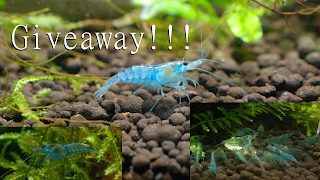 If you are in Canada and want some of my shrimp join the group and enter the contest. Giveaway contest closes Wednesday night at 8:00PM EST. I got my new manual Micro-Nikkor 55mm f2.8 lens for my birthday (Thanks Anna!). The "fishy" lens as it had been referred to around here for a while when I started looking for a new macro type lens to do some nice closeups of the shrimp. I wanted a new lens that let me get physically close up to the tank to take some closeup shots with my DSLR. My previous macro lens required me to be several feet away in order to focus on anything. That's fine for flowers, but I wanted to be sitting close to the shrimp to take their pictures, not across the room. It's nice to be able to use the DSLR, even if the lens I could afford for it means everything is done manually. These are the result of my first photo session playing with the new lens. 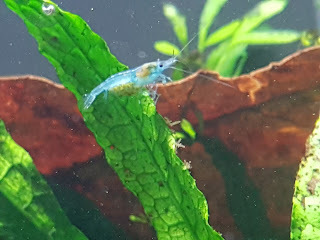 So I probably should have mentioned it at the beginning of the week, but Momma Shrimp is pregnant again with her 4th batch of eggs. but today we saw that there are 2 other expectant mothers among the Blue Velvets. The Blue Velvets are definitely about to hit that point where I need to move some into the new tank, or find new homes for some of them. Still no new mothers among the Crystal Reds, but given a little time I think we will see one. I haven't been able to get any good photos yet of the expectant mother shrimp, but I'll probably have some later this weekend.